If you’ve ever played NetEnt’s legend-themed slot, Excalibur, or the slightly quirkier myth-themed video slot, Unicorn Legend, from renowned slots developer, NextGen Gaming, you’ll probably get a kick out this. For plenty of conventional legend-based slots fun, online casino slot game developer Microgaming’s legend-themed slot, King Arthur, ticks all the boxes. Using such a well known myth is a very good place to start when you want to deliver a slot that will immediately resonate with its potential players. There are very few myths and legends that are more iconic, enthralling and famous as the legend of King Arthur and his Knights of the Round Table at Camelot. Microgaming’s 5 reel, 20 pay-line game is packed full of icons familiar to anyone who knows the myths and legends surrounding the Holy Grail, Excalibur and Round Table. A nice fanfare plays whenever you hit a winning combo, with some neat little animations to accompany wins. In fact, the layout of the game screen is pretty classic in nature, like a real-life video slot, with 3D buttons for spinning and adjusting bets. Those bets run from $0.01 to $0.50, with 20 pay-lines across its five reels. On the reels, you’ll find tonnes of Arthurian icons, such as Arthur himself, Merlin the wizard, the Holy Grail, Excalibur, and some regal-looking 10-through-Ace symbols. There are two win-inducing Wilds in the game: Arthur himself – who multiplies all wins he helps form by two – and Merlin, who substitutes for all regular symbols other than the Scatters and bonus icons. Five Merlins triggers a jackpot of 5,000 times your line bet, while five King Arthurs gives out a 10,000-line jackpot. Excalibur – the ‘sword in the stone’ which Arthur pulled out to become king – is the Scatter in the game, with five Scatters adding the ‘holy grail’ of a 32x multiplier onto your wins. There’s a bonus round too - the Camelot Bonus – which triggers when you hit three or more Camelot icons on the reels. Essentially a type of Pick ‘em Bonus, or Trail Bonus, you need to help Arthur get back to Camelot from his quests, and win some prizes en route. The roads all lead to different entrances at Camelot, with each door revealing a different prize. In the end, you can multiply your prize bonus from 1x to 4x. 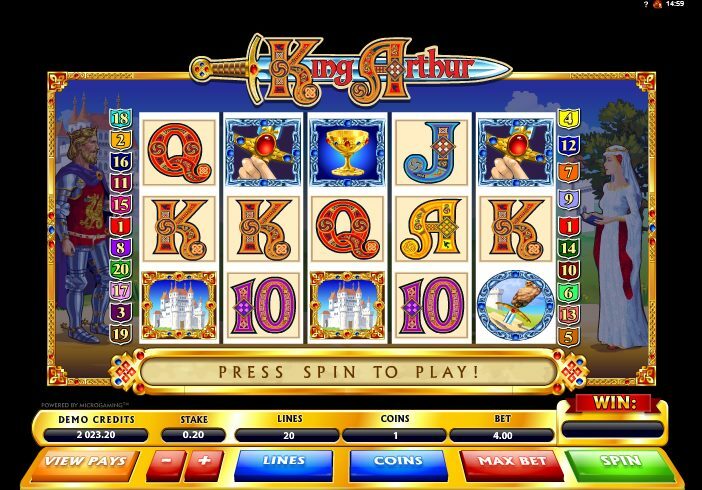 Authentic Arthurian slots are in good supply, thankfully, and King Arthur certainly can be added comfortably to every slots fan’s list of ‘must-plays’. The animations on winning spins are nice, the backdrops nicely-rendered, and the bonus round generous, if a little simple. 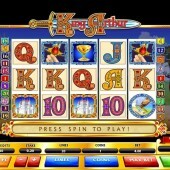 I would have liked to have seen some free spins added, but for what it is, King Arthur is perfectly good.